Among the most provocative examples of this way of knowing madness – that is, depicting it from the outside – are Hugh Welch Diamond’s attempts in the 1850s to create photographic ‘portraits of the insane’. Far more than painting, photography seemed capable of recording the succession of minute variations in emotional expression that signalled, for example, the shift from mania to depression or from illness to recovery. Diamond (1808–1886), chief psychiatrist at the Surrey County Lunatic Asylum, was quickly dubbed the ‘father of psychiatric photography’ (Gilman, 1976, p.5). In 1839, within three months of the announcement of commercially available materials and methods, Diamond made his first photograph (of a lace pattern). He became fascinated by the medium, photographing houses of famous writers, a still life of hunting paraphernalia, as well as his friends, his wife, his fellow physicians and photographers, and, of course, the patients in his asylum. Diamond’s most consuming interest was in depicting moments of madness – the slight elevation of the eyebrows that hinted at a feeling of suspicion, the vacant look in the eye of one who saw no purpose in living. By the early 1850s he was exhibiting grouped photographic portraits of his patients, with titles like ‘Phases of the Insane’. Diamond wanted to show how mental states could be represented in external signs. Physiognomy had long dominated medical thinking: just as a pounding pulse could signal cardiac difficulties, a certain expression could, he argued, reveal mental turmoil. If you could capture the look on patients’ faces, you could diagnose them. And patients were, of course, the perfect photographic subjects – always available (the benefit of locked wards), and ideally suited to reveal, by their extremes of emotion, the core qualities of ‘internal derangement’, as Diamond called it. A series of photographs of the same patient might even ‘mark the progress and cure of a severe attack of Mental Aberration’ (Diamond, 1856). In the original prints of Diamond’s photographs, patients’ conditions and their initials were printed under their portraits. However, as the photographs began to be reproduced and cited by other psychiatrists, the initials disappeared, illustrating one of the classic forms of simplification in scientific work that sociologist Leigh Star has articulated (Star, 1983). So, despite the sensitivity of Diamond’s portraits, which preserved the complexity of individual expression, patients again became defined in terms of their major symptom. By ‘freezing the features’ of his patients, as historian Sander Gilman has put it (Gilman, 1976, p.9), Diamond sought to go beyond the standard ‘acute’ and ‘recovered’ images that physicians had long used to represent the stages of illness. In a paper read to the Royal Society in London in April 1856, Diamond said that the photographer was in a unique position to ‘listen to the silent but telling language of nature’. He could ‘catch in a moment the permanent cloud, or the passing storm, or sunshine of the soul’. The fuzzy language of emotion could be replaced by the ‘marked precision’ of photography, a crucial advance for psychiatry, Diamond argued (Burrows & Schumacher, 1990, p.153). One of his most famous portraits, ‘Melancholy Passing into Mania’ (see right), shows a defiant woman in her late thirties who refuses to look at Diamond as he photographs her. Presumably, the woman in this portrait consented to sitting in the elegant wing chair on which Diamond has posed her, but her expression remains elusive, her mind clearly elsewhere. The technology of picture-taking in those early years required that a subject sit still for an extended exposure period. These portraits could never have been made without a ‘spirit of friendly cooperation’, as Diamond put it, between physician and patient. As two historians of his work have recently written, ‘there could be no scenes snapped in the ward, no secret portraits taken while a patient was unaware’ (Burrows & Schumacher, 1990, pp.48–49). This careful posing is evident in Diamond’s photographs as well as in those of his colleague at Bethlem Hospital, Henry Hering. In his Royal Society paper, Diamond said that ‘photography presents a faithful record, free altogether from the painful caricaturing which so disfigures almost all published portraits of the Insane’. He gives examples of patients thanking him for the opportunity to see portraits of themselves in disturbed states because it let them appreciate how much they had changed. By portraying his patients with the same calm formality as is evident in his portraits of friends and colleagues, Diamond saw himself as humanising madness and helping his patients to recover themselves. But of course these are still essentially depictions of pathological types. For all their noble sentiment, photographers like Diamond and Hering were trying to find some external mark, some sign that could give a glimpse of the mad mind. It seemed never to have occurred to them to ask patients directly about their feelings or the meanings of their unusual states. Hans Prinzhorn (1886–1933) took the opposite attitude. Trained in both art history and psychiatry, Prinzhorn eagerly collected works of art created by psychiatric patients. In 1919, when he was appointed assistant psychiatrist at the Psychiatric Clinic of the University of Heidelberg, Prinzhorn began writing to the heads of asylums across Germany, Austria and Switzerland asking them to look for ‘productions of pictorial art by mental patients, which are not simply copies of existing images or memories of their days of health, but intended as expressions of their personal experience’ (Brand-Claussen, 1996, p.7). In less than three years, he was able to assemble a collection more astonishing than any other, before or since, consisting of more than 5000 pieces by 500 artist-patients. Works arrived from dozens of institutions and took every conceivable form – paintings, drawings, sculptures, textiles, even installations. Their materials were varied and inventive, patients having apparently taken full advantage of any substance, technique or surface they could cadge or otherwise manage to acquire in a locked institution. Prinzhorn was astounded by patients’ resourcefulness and by the extraordinary range of works that arrived in response to his solicitations. There were drawings in pencil and crayon and charcoal, on school notebooks, institutional stationery, orange wrappers, torn envelopes, meal plans, packing materials, wartime propaganda pamphlets, and toilet paper. There were paintings on canvas, wood, tissue paper, and cardboard. Some of the wealthier patients had gotten access to oil paints; the poor used tempera, sometimes mixed with odd substances like cocoa, urine or blood. There were collages of painted or drawn images pasted to cutouts from magazines and newspapers, a few adorned with unusual objects like pebbles or pine needles. There were illustrated books bound with a paste of flour and water, their pages varnished or sewn together. A few (of the richer) patients had even worked in pigskin diaries. There were sculptures made from clay or wood or stale bread moistened with water. Embroideries and textiles were pieced together from scraps of material or abandoned garments or woven from thread unravelled from hospital uniforms or bedclothes. Some of the works were minuscule; others took up a whole room. No matter what their form, they had all simply been packed up (or, in the case of a few larger pieces, photographed) and shipped off to Prinzhorn with a tag or a ew case notes or no notation at all about the circumstances of their creation. Prinzhorn left Heidelberg in 1921 and died in 1933, just before the Nazi takeover. Many of the artists who created the works in his collection were murdered as part of the so-called ‘euthanasia’ programme (in which techniques like gassing, later used on a wide scale to eradicate the Jewish population, were ‘perfected’ on the already captive population of hospitalised mental patients). However, the artworks themselves were not destroyed because the Nazis wanted to use them for propaganda purposes. (For example, to illustrate the supposed ‘degeneracy’ of Expressionist artists, their work was displayed alongside that of Prinzhorn patients.) Fortunately, thanks to the efforts of many devoted curators and staff at the university’s psychiatric clinic, most of the 5000 works that Prinzhorn collected are now in their own beautiful museum in Heidelberg (http://prinzhorn.ukl-hd.de). These images stimulate a range of questions about the visual depiction of mental life. Diamond’s photographs and the works of the Prinzhorn artists are clearly fascinating, but can we say that they actually give us ‘ways of knowing’ madness? Is such a thing even possible, or does profound emotional distress simply defy any attempt to represent it fully? However we choose to answer these questions, we have to acknowledge that such difficulties have not stopped people from trying. From the colourful PET scans of the so-called ‘schizophrenic brain’ that now fill psychiatric textbooks, to the cartoon images of neurotransmitters in pharmaceutical advertisements, to the extravagant performance art created by activists in today’s mad movement, images of madness are everywhere. I myself think that the only meaningful approach is to start with the lived experience of individuals, contextualising their ‘madness’ within the rest of their life story and experience. The title character of my recent book, for example, is a Prinzhorn artist, Agnes Richter (Hornstein, 2009). 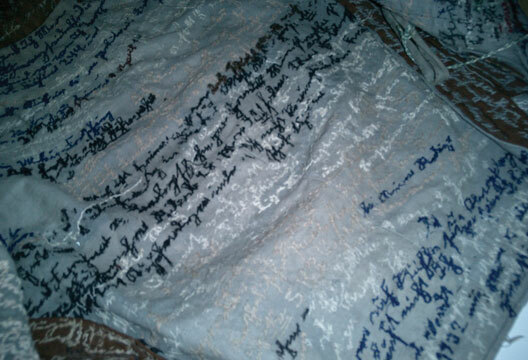 She told her story in the form of an extraordinary jacket – which she constructed out of a re-sewn hospital uniform and then turned into an autobiographical text (see box). What did Agnes and the thousands of other psychiatric patients who have left narratives want us to understand about their experiences? To me, that is the key question to be asking – what is madness from the inside? Agnes Emma Richter, born 21 March 1844 near Dresden, Germany, was a skilled seamstress who supported herself doing that work in Germany and America until her late forties. She had saved up a considerable sum by that time, and when police forcibly admitted her to a local mental institution because of complaints from her neighbours, she told them that people were plotting to steal her money and she ‘believed her life to be in danger’. Increasingly angry and ‘non-compliant’ with her incarceration, she was transferred in 1895 to the state asylum at Hubertusberg, where she was kept against her will for the next 23 years, until her death on 1 July 1918. We know practically nothing about the details of Agnes’s life in the asylum. Of the 76 pages of her case file, 70 deal entirely with disputes about who will pay the costs of her institutionalisation (suggesting that her concerns about people ‘stealing her money’ may have been well founded and not ‘paranoid ravings’). An unknown asylum staff member sent Agnes’s remarkable jacket to Hans Prinzhorn, accompanied by a tag that read ‘memories of her life in every piece of washing and clothing’. Even among the thousands of extraordinary objects in Prinzhorn’s collection, the jacket stands out – a powerful and intensely personal piece of textile art with a challenging message. Nothing is known about when or precisely how Agnes created the jacket, except that she seems to have taken apart her shapeless hospital uniform and reconstructed it into a beautiful and elegant garment. The delicate buttonholes, the cuffs flaring from tightly fitted sleeves, and the peplum (a decorative ruffle attached to the bodice) all offer evidence of her considerable talent as a seamstress. The bluish-grey linen is accentuated by sections of brown felt attached to the collar and parts of the back of the torso. But what makes the jacket so extraordinary and so distinctive are the dozens of lines of text that cover practically every inch, sewn in five colours of yarn and thread that give the impression more of a painting than an everyday garment. The words are stitched with barely any space between them, spiralling around each sleeve, flowing from the outside to the inside, and then at various points simply trailing off. Agnes used an ornate form of cursive writing (now unintelligible to contemporary German speakers) called Deutsche Schrift, and this, combined with the compressed form of the phrases, give the text an almost hieroglyphic appearance. Certain sections have, however, been painstakingly deciphered, making clear Agnes’s intention to recount details of her experience at Hubertusberg. The words ‘I’ and ‘me’ appear often, along with various phrases having to do with her sister, her desires, and her anguish, with ‘I plunge headlong into disaster’ being the most provocative. We cannot now know whether Agnes Richter saw her work as a political act, ‘a weapon of resistance to the constraints of femininity’ as Rozsika Parker labelled the art of embroidery in her classic feminist analysis, The Subversive Stitch (Parker, 1996). But the jacket and its text offer a powerful challenge, reminding us that madness is more code than chemistry, and if we want to understand it, we need native speakers, not just brain scans. - Until the end of January, readers can buy Agnes's Jacket by Gail Hornstein at the special price of £12.00 including P&P. Enter code BPSAGNES at the PCCS Books website checkout.